If you have a laundry washer and a dryer from two different manufacturers and are wondering how to stack them up on top of one another, read on. I will demonstrate how I stacked my new LG WM1355HW washer with Kenmore 417.93142203 dryer. It cost less than $30 for materials and it took several hours to complete. My matching Kenmore washer died beyond repair recently leaving me with a perfectly fine gas dryer. The two units were designed to safely stack together, but finding a new replacement washing machine that could stack with the existing dryer was impossible. Allegedly washing machines are engineered to fail after eight years of use and my experience proves it. This is maddening, but the worst thing is that there is no standardization of any kind. Separately purchased units don’t stack. Dimensions vary widely. Manufacturers want you to replace the washer/dryer combos even if only one appliance fails. Use this example at your own risk. If your machines topple over don’t say I didn’t warn you. I am not saying my stacking solution is safe, but it feels very sturdy. Make sure the washer is on the bottom. I build a coupling brace of 3/4” plywood and 3/4” thick boards. It snugly fits on top and hugs the sides and the back of the LG washer. Based on the connections on the back of your particular washer you may have to cut into the back board to allow access. I had to do this for the water connections and for the AC cable. 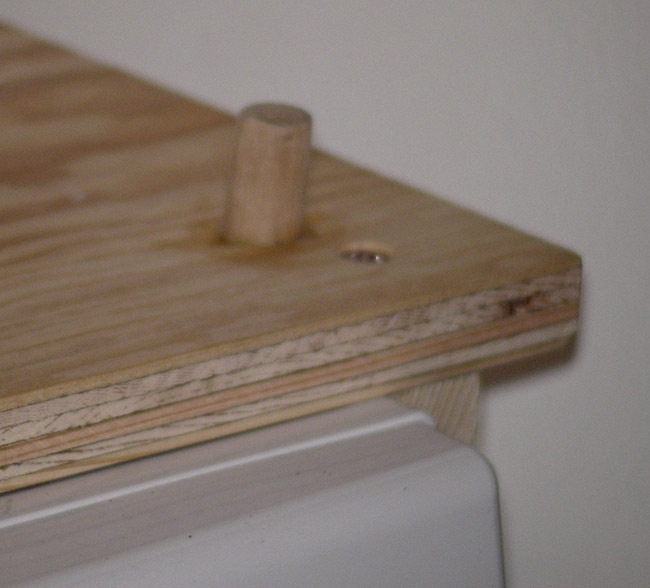 Although the diagram indicates something like finger joints between the boards and the top plywood, I used glue and wood screws to hold the pieces together. 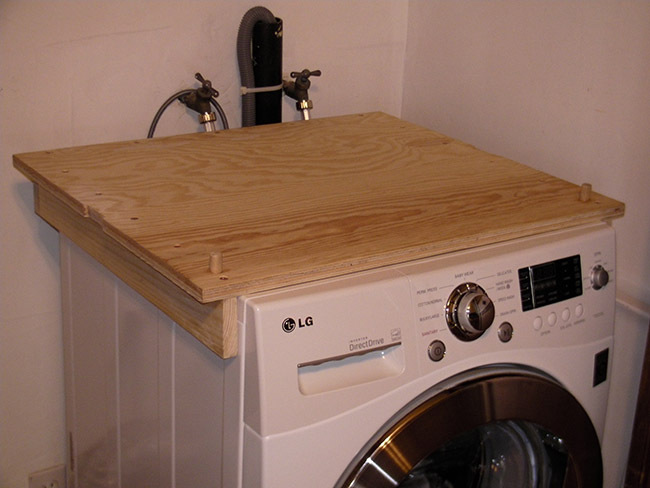 The drier is larger than the washer so the rectangular plywood top of the brace extends over the edges of the washer. On the left and the right of the brace I cut in two notches a little wider than 2” to keep the safety strap in place. My dryer has removable feet that are screwed into the holes at the bottom of the unit. I glued two 1/2” round pegs into the top of the brace. The pegs perfectly match the placement of the holes on the front of the dryer. Once I coupled the washer and dryer, I ran a 20′ long 2” ratchet strap around the two units and made it real tight. That’s all. The extra weight on the washing machine makes it vibrate less during the spin cycle. Two years later the dryer hasn’t fallen off! lol. looks like a 29″ wide dryer on top of a 27″ wide washer. I’ve doing a similar thing, but they are both 27″ wide. I just use some metal straps and sheet metal screws. I think dryers are pretty stable because they are relatively light and don’t have spin cycles! Just don’t try to put a washer on top of a dryer! That’s for sure. You don’t want a washer on top of a dryer. I also have an uneven Spanish tile floor and when the washer spins the whole thing shakes. The dryer would have flown off if it weren’t for the strap. 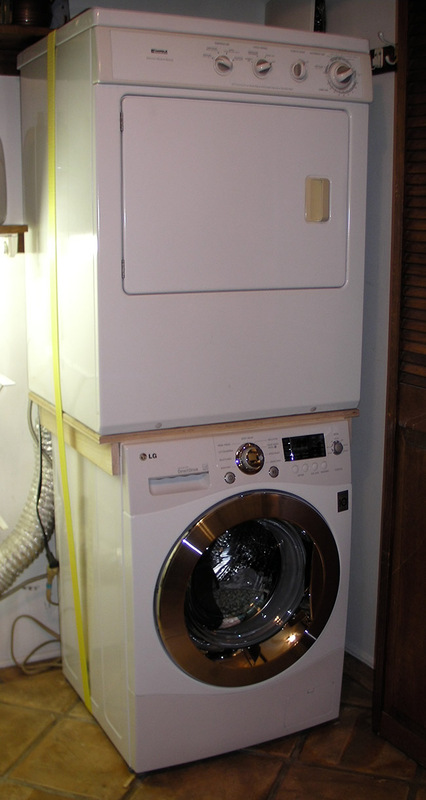 I’m trying to do the same – replacing 27″ washer & putting the old dryer on top of it. Dryer also 27″. The new washer is about 3″ deeper than the old one, so I’ll need to make a new back bracket. Do you mind sharing your stacking kit design?